One again, the guys at Major League Mods have given Fanboy a peek at their latest work — a special Star Wars-themed surround sound system. 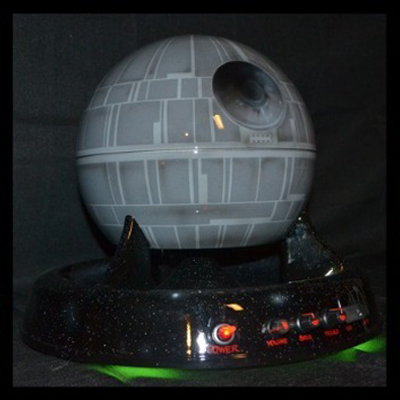 This simple 200 watt 2.1 setup features two TIE fighter satellite speakers and a subwoofer modeled after, you guessed it, the Death Star itself. If you’re concerned about how they sound, each TIE fighter comes equipped with a Yamaha 2¾ inch mid-range and 1 inch dome tweeter with built-in crossovers. The Death Star sub comes with a 6½ inch driver, a full set of control knobs and switches — power, treble, bass, and so on — and features a custom paint job by Nub Graffix. In addition to the RCA inputs for the satellites, there’s also an auxiliary headphone jack for your favorite iDevice. It might not be as powerful as any five or six speaker set, but its still potent enough to deliver. If you’d like to see or hear it for yourself, Major League Mods will have a booth at New York Comic Con on October 13th through 16th. If you take the time to stop by, they’ll even let you enter for a chance to win one of their custom R2-D2 Xbox 360s. And, finally, if you’d like to get in touch with them about possibly building you a custom in the future, you can visit their official website for more information.